"We Build Supercars not Replicars! 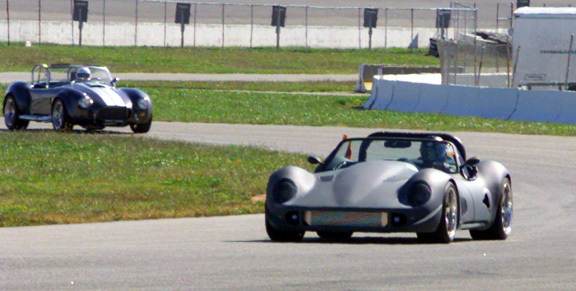 Dragon Motor Cars has been competing with their quality light-weight High Performance original design sports cars since 2001. 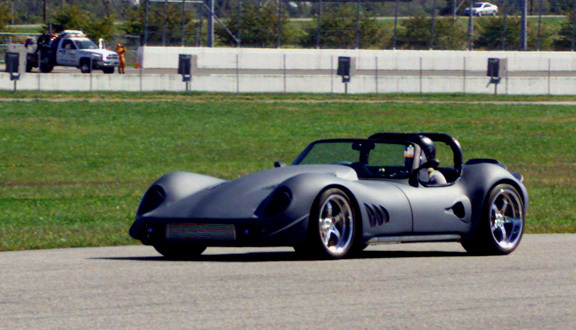 Using race-proven stock Corvette C4 and C5* aluminum suspension components in a dedicated race quality chassis with a vintage-styled original fiberglass body and small block engine, the result is stunning in appeal and proved its world class performance on the track with Class Wins each year we raced. Run & Gun 2008 was a GREAT Event!! 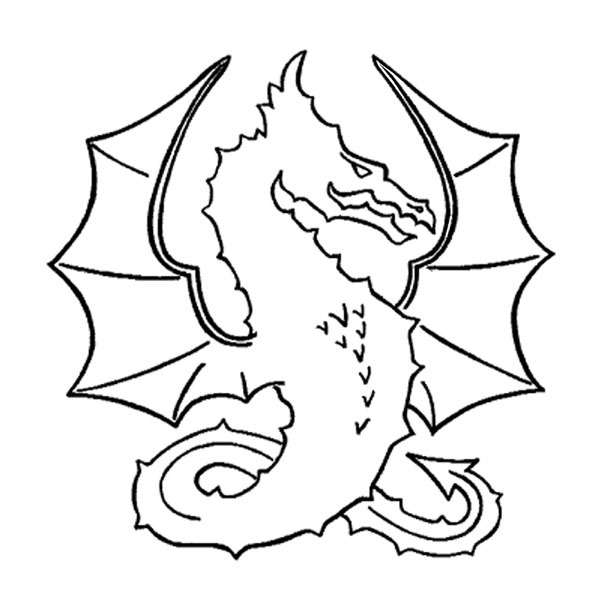 Here are some shots of Dragons in action. 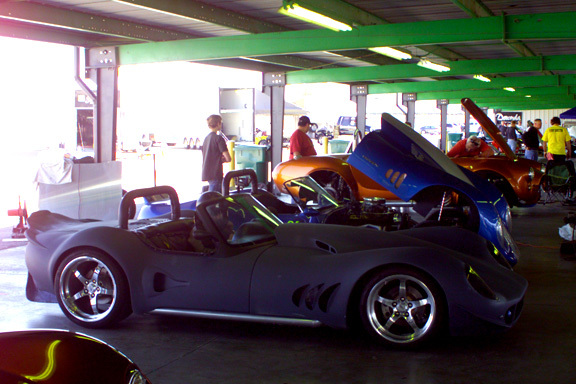 Three Dragons made their way to St. Louis for the 2008 edition of Kit Car Magazine's Run & Gun event. 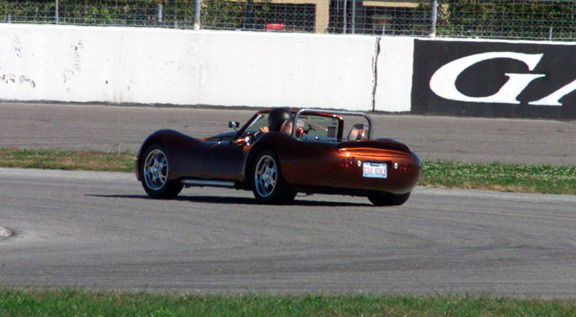 John put a shortened and narrowed C5 Chassis under a snake body for the first time(all STOCK C5 components with a differential conversion plate so he could run a narrow drive shaft to the C5 Transaxle and keep stock Cobra body) so wasn't competing as a Dragon. Paul drove Blue (even through the deluge from Indianapolis to St. Louis) all the way from NH to compete. Blue made sure Dragon could defend Street Small Block Title in both Auto Cross and Road Course and, by finally getting winning drag time acknowledged, can be officially crowned Overall Small Blcok Street Champion. Count 3 Dragons in the paddock. Brian White's Candy Copper SeriesII(nose in forground), Brett's Custom SeriesII Superdragon, & Paul's Blue SeriesI. John's newest C5 Cobra project(on jackstands) needed another day of assembly before he could drive it for the first time anywhere, never mind try to run it at speed. Paul's Blue Dragon on the grid waiting for his last Run in the Auto-Cross Course. 3rd time's the charm as he posted fastest time for Small Block Street Class. 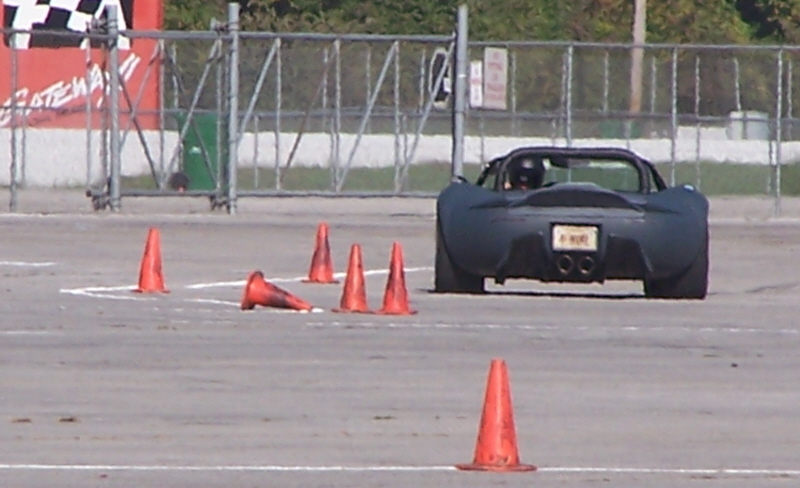 Brett exits slalom section of Autocross. Ready to kick in the afterburners. 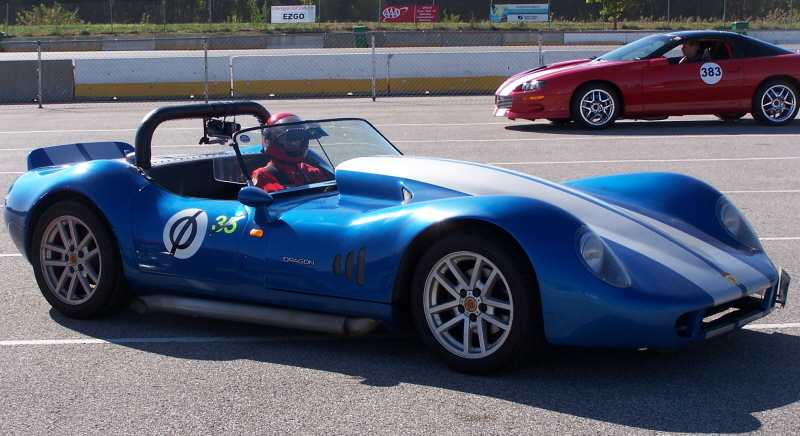 Blue Dragon waits at start line of Autocross course. 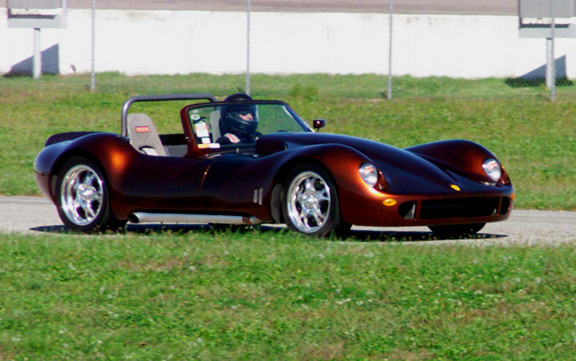 ©2009 Dragon Motor Cars, LLC. Corvette C4 and Corvette C5 are registered marks of General Motors Corporation. 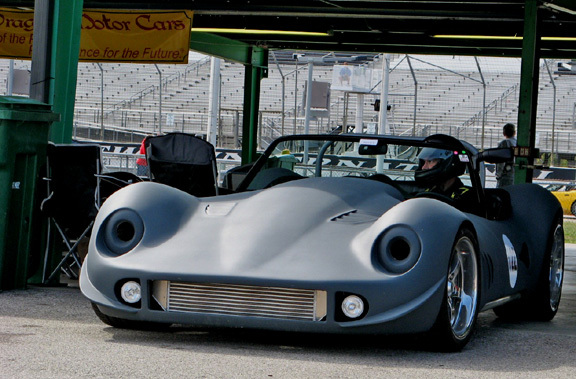 Cobra is a registered trademark of Ford Motor Company. 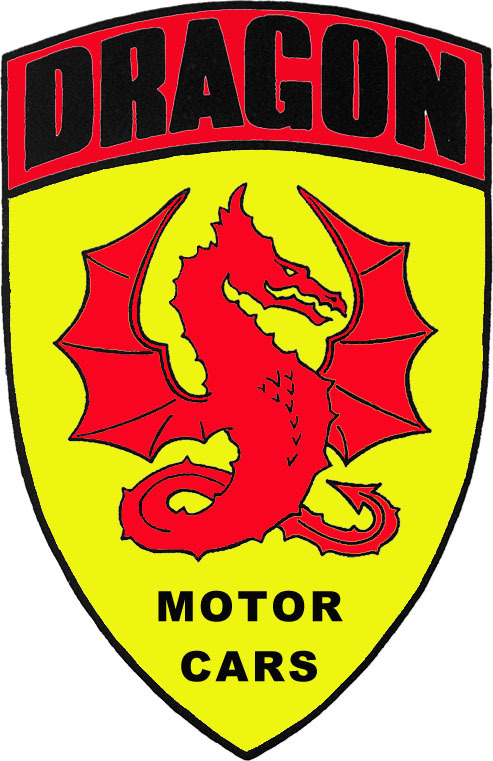 Dragon Motor Cars is not associated with Ford Motor Company or General Motors.